When on the search for a new dripper, the internet is my first port of call. It’s one of the easiest ways of seeing all that is on the market and reading to reviews to find out what is going to meet your needs but sometimes it’s really really frustrating. I did much research, decided the dripper for me was the hobo v2.1, had my heart set on it, went to buy it, could I find it? No. They’d stopped production and were working on the v3 so I ended up finding a clone and decided as it was the closest I was going to get I may aswell give it a go. Here’s what Custom Vapes have to say about it. The Hobo RDA is precisely machined RDA with adjustable airflow control from the top of the dripper pointing directly down towards the coils, also a secondary airflow control ring that controls the outside airflow holes. The Hobo RDA V2.1 allows you to unscrew the outside ring from the deck to fully expose your building area but still have the o-ring to give you a solid seal when you screw the ring back on. 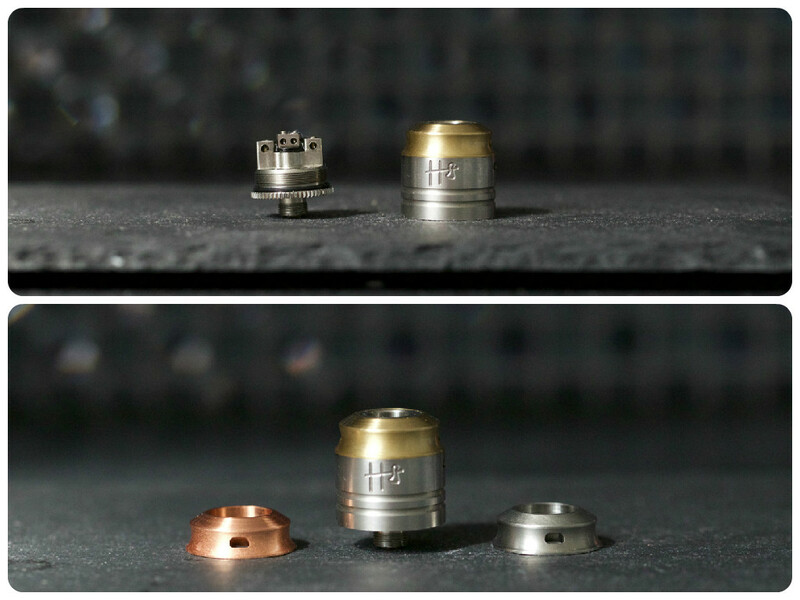 It’s dual airflow options makes this revolutionary RDA a must have! I obviously can’t compare mine with the genuine one because I’ve never felt it or used it but I am generally impressed with the quality. The box came with spare o rings, an allen key, and three different toned metals for the upper airflow control. Annoyingly, the allen key is super tiny, and if you loose that, I think you’ll have trouble finding one small enough, if anyone knows where I can get one though, let me know – just incase. It feels well made and everything sits and screws down exactly as it should, so it gets a big thumbs up there. The juice well deck that unscrews (I forgot to photograph it) twists and the airflow gaps should sit right infront of where you place your coil but when you screw it in, it doesn’t align quite right. It’s not a huge problem because you can easily loosen it a little bit but I’d imagine the original didn’t have that problem. The deck is easy to build on, and being able to remove the outter ring does make building on it super stress free. Aesthetically, I like the chunky square posts but thats quite of irrelevant as it doesn’t really influence performance. It uses grub screws which are good because your build stays tight which means no shorts and they are fully adjustable meaning you can get some thicker builds in there if you so wish. The small chamber means that flavour is incredible, which is the main reason why I wanted it so badly. I’m not overly bothered about clouds, I just want to get the best out of my juice. The juice well is deep, so you can drip quite generously and not have to worry (within reason) about leaking. The main airflow holes are quite high which also contribute to quite a leak free atty but the upper airflow makes it so customisable it is, you can really get a draw that suits you. All of it changing vapor production and flavour so it is super versatile.